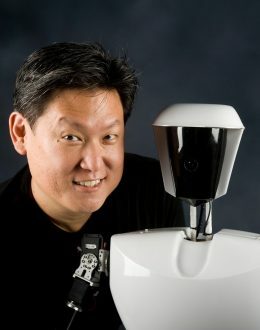 Dr. Dennis Hong, a TED alumnus, is a Professor and the Founding Director of RoMeLa (Robotics & Mechanisms Laboratory) of the Mechanical & Aerospace Engineering Department at UCLA. His research focuses on robot locomotion and manipulation, autonomous vehicles and humanoid robots. He is the inventor of a number of novel robots and mechanisms, including the ‘whole skin locomotion’ for mobile robots inspired by how amoeba move, a unique three-legged waking robot STriDER, an air-powered robotic hand RAPHaEL, and the world’s first car that can be driven by the blind. His work has been featured on numerous national and international media. Washington Post magazine called Dr. Hong “the Leonardo da Vinci of robots.” Dr. Hong has been named to Popular Science’s 8th annual “Brilliant 10”, honoring top scientists younger than 40 years of age from across the United States, “Forward Under 40” by the University of Wisconsin-Madison Alumni Association, and also honored as “Top 40 Under 40” alumni by Purdue University. Hong’s other past awards include the National Science Foundation’s CAREER award, the SAE International’s Ralph R. Teetor Educational Award, and the ASME Freudenstein / GM Young Investigator Award to name a few. Dr. Hong also actively leads student teams for various international robotics and design competitions winning numerous top prizes including the DARPA Urban Challenge where they won third place and the $500,000 prize, and the RoboCup, the international autonomous robot soccer competition where his team won First Place in both the Kid-Size and Adult-Size Humanoid divisions and brought the Louis Vuitton Cup Best Humanoid Award to the United States for the very first time. Dr. Hong received his B.S. degree in Mechanical Engineering from the University of Wisconsin-Madison (1994), his M.S. and Ph.D. degrees in Mechanical Engineering from Purdue University (1999, 2002). He is also a serious gourmet chef and a magician performing annual charity magic shows and lectures on the science of magic.